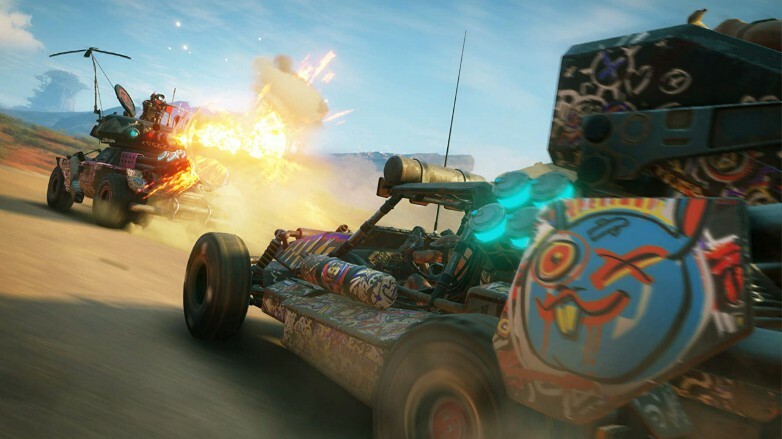 RAGE 2 Preview: It's a Mad, Mad World | Nerd Much? When it all clicks, RAGE 2 was an absolute blast to play that had me giggling like a child on Christmas morning. A symphony of bullets, chaos, and explosions, RAGE 2 is an unwieldy beast that tasks players with one simple mission: Kill every bandit in the most creative way possible. Recently, we got a chance to sit down and play roughly 90 minutes of RAGE 2. We were dropped into the world about a quarter-way through the main story and set loose to do whatever we wanted. Developer id Software also gave us four unique powers, along with a small arsenal of weapons including a shotgun, burst pistol, assault rifle, and rail gun. The press was allowed to explore the world, partake in side activities, or follow the main story. Perhaps the most notable shift in this sequel is just how much more engaging the combat feels. Mixing Bulletstorm with DOOM, players are encouraged to constantly think outside the box when fighting. Gone is the original RAGE’s bland and uninspired gunplay, with the one exception of bladed boomerangs known as Wingsticks. In its place sits a system that allows players to launch enemies into the air, set them on fire, and then force push them off a cliff. While this might sound tricky, RAGE 2 does a solid job of streamlining its mechanics by removing a lot of restrictions. Any of the powers such as a ground pound, dash, or force push sport a modest cooldown, allowing you to use them pretty frequently in a single battle. Additionally, we also had access to a skill that let us throw a grenade with a very strong gravitational pull. This would not only drag every item not nailed down to its location but cause everything caught in its vortex to launch into the air. These abilities aren’t just for setting up spectacular kills but can be used tactically to counter enemy movements. Ripping foes out of their sniper’s nests or hurling an explosive barrel can quickly flip a difficult battle on its head. Things get even zanier when you begin to use the variety of different weapons at your disposal. Most guns have a primary and alternate fire, such as the shotgun launching a condensed shot that knocks foes away when you aim down the sights. It’s a nice change from the traditional FPS weapons we see. This makes the moment to moment gameplay far different, as you have to think about what modes on what guns suit your needs. There’s certainly a learning curve and I had to train myself not to look down the sights when I wanted to just fire a single rocket and not a whole cluster of them. My personal favorite was a weapon that let you tag foes with darts and then send a beacon that literally pulls any marked target to it. Using this devious device I was able to send enemies flying in every direction like some kind of mad bungee cord wielding wizard. Wingsticks also make a return and can now lock onto targets if you hold the throw button down. It’s a small change, but it makes actually hitting a target way easier in all the chaos. Where things begin to stumble is when you hop into the seat of a vehicle. Driving has always been a part of RAGE, but I’m concerned it will once again take a backseat. Given how creative the gunplay is, shooting other vehicles is not nearly as exciting. Id Software did confirm at the event that there would be four types of weapons including machines and a mortar. However, I was unable to see what that would look like since my ride only had a boost and some machineguns. This feels by the numbers when compared to all the cool abilities and guns players get to wield. The car combat is clearly looking to be a bigger chunk of the game, as there races to win and heavily guarded convoys to sack. 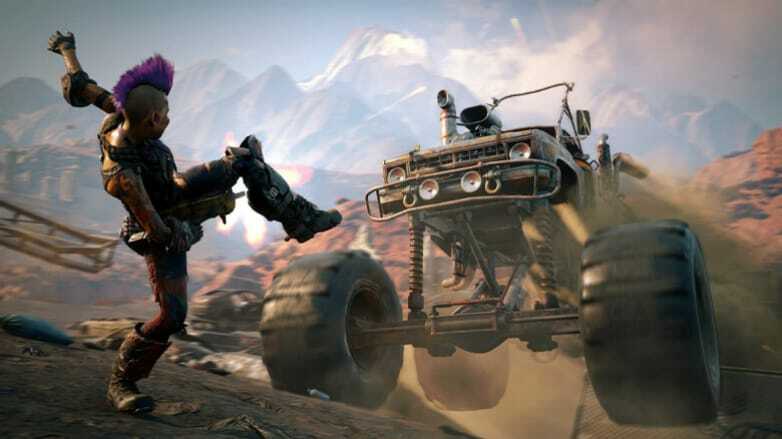 Even with Mad Max developer Avalanche Studios also working on RAGE 2, we worry that this will end up being a forgettable addition. 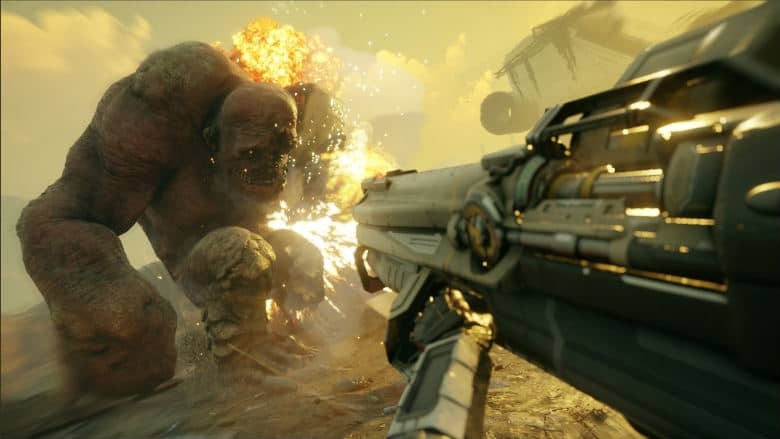 RAGE 2 also has a lot of activities to complete and when the developer revealed all of the side-mission nodes it was a little overwhelming. There were a lot of icons competing for my attention and it will be vital that RAGE 2 doesn’t just bombard the player with a ton of random things to do. These points of interest have to be more than just “things to do.” We did earn reputation with one of a small handful of key people, but how that experience affects the larger game is still unknown. The story mission I played faired much better, as it had me competing in a post-apocalyptic gameshow. Broken up into four rooms, all I had to do was survive wave after wave of mutant enemies. This was easier said than done since most of the rooms featured traps and mutants are extremely aggressive. It was exactly as zany as it sounds, but the environmental traps allowed me to set up some pretty creative kills. Sadly we didn’t get too far into the main campaign, but it’s obvious that id Software is putting a greater emphasis on the story this time. The small handful of characters we met came off as more than just typical post-apocalyptic archetypes and our hero actually talks this time. While the dialogue had a few cringe-inducing moments, most of the jokes stuck the landing. Given we were only shown a small fraction of the world and people in it, there are still a ton of questions hovering around the story. 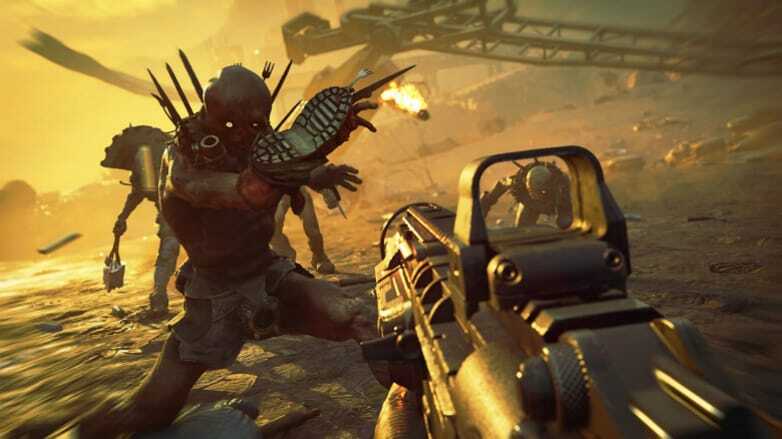 RAGE 2 needs to be more than DOOM in a post-apocalyptic setting and we hope this world has a ton to offer players. We’re still a few months away from RAGE 2’s release, but what I saw was a promising start. Despite the world having some familiarity, the combat system felt completely unique. There’s a ton of potential here and we suspect the gaming community will come up with some insane kills once RAGE 2 launches. I still have lingering concerns about the cluttered map and vehicle combat, but it’s too early to have a definitive stance on these issues. As it stands, RAGE 2 was an absolute blast to play and I’m excited to see how the game progresses. Want to know what other games are on the way? Check out our mega list of all of the known 2019 video game release dates.